When your baby is about six months old your GP or health visitor would recommend that you think about starting to wean your baby from milk to a combination of solid foods and milk. It’s at this age that they are more able to digest and absorb the food and use it in the best possible way. At six months they are more likely to be able to sit up, perhaps with a little support, which makes it safer and easier for them to be able to swallow. Six months is a great age as they’re curious about everything and their hand-eye co-ordination is developing, making the journey from plate to mouth so much simpler. There is such a wealth of information available for parents about weaning and the different methods such as baby led weaning (BLW) and the traditional method. The following information will give you a taster of how to get going. Remember, you will still need to either give breastmilk or formula until your baby is at least 12 months old. If you are breastfeeding your baby, weaning onto solid foods doesn’t have to mean the end of breastfeeding. Continue for as long as you feel comfortable, milk should continue to be given until your child is at least 12 months old. Until your baby is eating three meals a day, milk is supplying them with much needed vitamins, iron and protein. However, your baby will obviously require less milk, now that they are filling-up on solids. Baby led weaning or the traditional method? The traditional version, and still a popular choice, is using quite bland foods such as baby rice or porridge mixed with breast or formula milk. Use a soft spoon with some food on it and gently guide it towards your baby’s mouth. You could, if you wanted, give your baby a spoon as well and let them experiment at the same time. Remember this is unknown territory for your child, so it may take a while for them to get the hang of it. They don’t know what to expect and could be either overjoyed with the experience or equally repulsed by it! Whatever happens, try to remain calm. You start with one meal a day and introduce foods slowly. More recently, some parents have started to do baby led weaning. With baby led weaning you don’t need to start cooking and pureeing foods and you don’t have to spoon feed your baby. Instead, you use your baby’s natural desire to explore and experiment and copy others by providing suitable foods for them to touch, pick up and eventually put in their mouths. You give baby the sort of foods you eat and let them decide. There are no set rules to baby led weaning but most parents offer food when they are eating and eat with their baby as it all about being relaxed and social at meal times. Over time, and when the baby shows interest, parents build up the number of times their baby is offered food. To begin with you can cook peeled vegetables such as potato, carrot, sweet potato or parsnip mashed or in bite-sized pieces, mashed or sliced banana, avocado or cooked and peeled apple or pear or simply food from your plate. Your baby is in control of what they are eating and how much they want to eat. You can also offer a loaded spoon of food for them to try and get in their mouth! If your baby doesn’t seem to like something, don’t worry. There will be plenty of meals to come where you can try that particular food again. Remember we adults have certain foods we like and others we don’t - your child will be the same. With regards to how much to give them, recent studies have shown that allowing babies control over the amount they eat can help to prevent weight issues later on. As your baby reduces the amount of milk they take during the day because they’re eating proper food it is a good idea to offer them drinks. Recommended drinks for babies are water (bottled water is not suitable for infants unless stated on the label) and pure orange or grapefruit juice, maybe diluted as necessary. Whichever version you choose to use - it’s going to be messy! You’ll be surprised how much mess one baby and a small amount of food can make. If you have twins or multiple babies, just multiply everything! Being inquisitive little things, your baby will probably want to start playing with their food to find out more about it so expect fingers or maybe whole hands to be dipped into the bowl and almost certainly smeared all over the place. This is very normal at this stage and goes with the territory. Being prepared with plenty of paper towels or a clean cloth will help you to remain calm. Ensure your baby is sitting upright and facing forward – a highchair works well for this – so they are able to explore foods with ease and are at less risk of choking. Offer your baby their usual breast or formula milk feed, and then before they are completely satisfied, try a small amount of mashed vegetable or fruit. This could also work mid-feed rather than at the end, so try whichever suits you and your baby. Make sure any hot food is stirred well and tested by you, to ensure it doesn’t scold them, which could also put them off trying it. 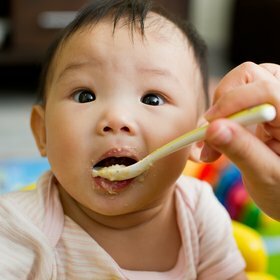 Most weaning babies prefer to try food with their fingers at first, and take time adjusting to taking food from a spoon, so try to be patient and use a rubber-tipped spoon to protect your baby’s sensitive gums. Set out some newspaper or a mat to catch any mess that spills over. Don’t force food on your baby. If they really don’t want it, try again later. Wait for your baby to open their mouth for food being offered. Allow them to feel the food in the dish or on the spoon – we would want to know what we’re eating, so it’s only natural that they will too. Let them feed themselves using their fingers as soon as they show an interest in doing so – yes it will get messy, but it’ll be worth it to see them eating and enjoying their food! Remember that your baby is finding out about new tastes and textures so give them a range to try. They are just starting to learn that food doesn’t come in a continuous flow, the way they have been accustomed to for the first six months or so of their life, so above all, be patient with them and let them develop their likes and dislikes at their own pace. With both methods you will soon be introducing many of the various food groups. We all need a variety of nutrients and babies are no exception. If you have any concerns whatsoever and need specific advice you can speak to your health visitor. It is advisable to speak to them before you do start the weaning process, particularly if there are any allergies or a food intolerance history in your family. What is important to remember is that food is one of life’s pleasures and we can make it an enjoyable experience for our babies if we are not stressed ourselves. Keep in mind they won’t like everything you put in front of them - that’s ok and you can try it again at a later time and until a baby is one; formula milk or breast milk will provide all the nutrients they need. Your baby is an individual and they can be encouraged to try certain foods, however, they will make up their own minds which are enjoyable to them and you can enjoy watching them taste and learn and grow healthily. Start with a couple of teaspoons (most will be spat out at first). Increase the amount you give gradually, as and when you are both ready. If your baby is showing signs of still being hungry, then give them a little more food each time. Offer two to three servings of starchy food per day, such as potatoes, yams, baby rice or bread and two servings of fruit and vegetables. To maintain a balanced diet, your baby should also have one serving of one of the following food types each day – soft cooked meat, fish, eggs, tofu or pulses such as beans or lentils. Start of with offering solid food once a day and then building up to two and then eventually three feeds. Once they are taking three feeds a day, you will notice that they want less milk. If you are breastfeeding you will need to reduce the amount of times you breastfeed them in a day, and if you are bottle feeding, you can miss out a milk feed, as long as you continue to provide formula milk till they are at least 12 months old. Once your baby reaches about nine months, offer them three to four servings of starchy food each day, and three to four servings of fruit and vegetables. By this stage it would be useful to include your baby in the family mealtime routine – so feeding your baby at the dinner table with the rest of the family, this will encourage them to eat, and develop a good pattern of having three meals a day. If your baby is very active – crawling all over the place – you may need to increase the amount you are feeding them, as they need the energy food provides for growth, and so ensure they are having full-fat dairy products (e.g. yoghurt or cheese) as reduced fat products are sensible for adults but should not be part of a baby’s diet. For more info on what foods to give your baby at different ages and stages in their development, visit the Food Standards Agency website.